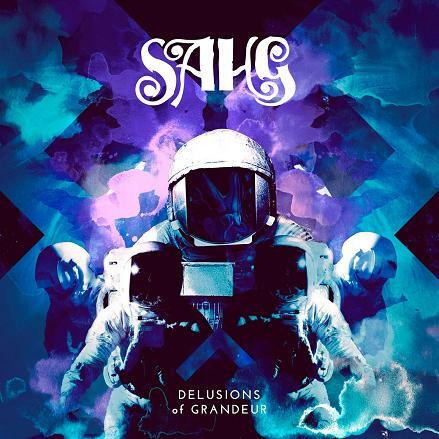 Tis an inspirational quote Norwegian doom metal band Sahg had apparently kept in mind while toiling away on their fourth full-length album, Delusions of Grandeur. A little more than three years after their prior release, III, the quartet have not only brought in a new bassist in Tony Vetaas, but they’ve ridded themselves of all numerical implications; reagents that have likewise meddled with the band’s hard-driving melodic doom by procreating a record that is, on the onset, considerably harder to plumb, but then much more reflective than their past efforts. As the album cover suggests, the very tone of Delusions of Grandeur is decidedly bluer, partially progressive, with the astronaut artwork effectually prepping the listener for an experience that often blooms with moments of psychedelia that hovers across a track like the sweeping album closer, “Sleeper’s Gate to the Galaxy,” or “Blizzardborne” with its endearing vocal layers and soaring, dreamlike guitar work. While III was a legit road-tripping soundtrack, featuring Sahg going full-groove-throttle ala Grand Magus or Spiritual Beggars, things are a bit more serious on Delusions of Grandeur. “Walls of Delusion” is plodding doom metal that works magically with emotion (none of which are of a sunny disposition), pacing between bouts of grumbled caveats, forlorn melodies, and splintered stoner metal riffs. This mixture of dangerous doom and swirling, often beautiful psychedelics is an effectively jarring dynamic that’s not far removed from the likes of a Mastodon and Fates Warning mash-up. A track like “Then Wakens the Beast” seems like an apt example in how Sahg have anted up the aggression while honing in on the delicate, adding small moving parts to the giant’s frame and allowing us to look inside and see how things exactly tick. The music on Delusions of Grandeur sounds so much more calculated than its predecessors, which may end up being its greatest burden, but also its most redeeming asset. Sahg’s past albums may be more accessible, but there’s so much more to digest on this creation. A worthy addition to an already stellar catalog. This entry was posted in Reviews and tagged delusions, Grand Magus, sahg, Spiritual Beggars.